2. If I absolutely had to choose one decade that was my favorite for film, it would probably be the seventies. The fact that forty percent of my list are absolute genre staples from that decade, well I’m disgusted with myself, and you should all throw stones at me. 3. The title that I’m absolutely, positively, wholeheartedly filled with shame for never seeing is the most current on the list, Inland Empire. For two reasons. One, David Lynch has had a spot firmly cemented in my top three favorite directors for about twenty years now, so for me to have never seen this fills me with shame. To make matters worse…. I own the dvd. I’ve owned it for a few years now. It’s been neatly filed away in the “I”s on the shelf for quite some time and I have absolutely no excuse to have never watched it. Alright, there you have it. I’m going to go start working on my redemption. Since I’m starting this late, I’ll have to double up on a couple of months. Not sure when, but you’ll know when I do! Cheers. For certain, there are films that, due to nostalgia and the way they’ve seeped into the grout of my mind, are given a wide latitude when it comes to their inherent flaws. I’m always reminded of this when I force myself to remember giant logistical and plot holes in movies such as Halloween and a Clockwork Orange when I cite them as far more sophisticated to whatever likeminded movie is being discussed. Perhaps Halloween’s myriad of logical missteps are just because the broader picture was so compelling that I thought it unnecessary to sweat the details such as the mysteriously slow police response time to the hardware store robbery (Michael Myers is wearing the mask that he stole at least six hours before the alarm is shown as blaring) and the fact that Donald Pleasance is standing next to the stolen car for hours before he realizes it. Therein lies the danger of watching crowd-pleasers late in life; when cynicism, snark and irony have twisted your heart and soul even in the most minimal way. This is why I can almost guarantee you that a 40 year-old who sees John G. Avilden’s Rocky for the first time in 2014 will likely become the least popular guy in his movie club discussion circle. And this leads me to Rio Bravo, a movie I neglected to watch time after time throughout the years. I even resisted it in college when I took an undergraduate class that was specifically about the films of Alfred Hitchcock and Howard Hawks. I suppose it’s a positive in that I didn’t dislike Rio Bravo and, in fact, liked many elements of it very much. But I can’t shake the feeling that this is a movie I would have loved had I just watched the damn thing between the ages of 18-24 which is exactly the same time I was moping around and extolling the brilliance of Bob Fosse’s cinematic output. I should probably preface all of this by saying that, along with war pictures, big-budget musicals and romantic comedies, the American Western remains one of my least favorite genres. To be sure, there are exceptions. My time as a film student helped me love movies like Stagecoach and kind of appreciate the Searchers and Red River. I’ve also enjoyed off-kilter American westerns such as Jim Jarmusch’s Dead Man and Robert Altman’s McCabe & Mrs. Miller and, finally, I remain a stalwart fan of every movie Sam Peckinpah made, western or “coked-up non-western”. But I remain blissfully ignorant of stuff like 3:10 to Yuma, True Grit, the Man Who Shot Liberty Vallance and High Noon (which will be covered on this here blog in December). Like most of my least favorite genres, the American Western relies on such an idealized foundation that there doesn’t seem to be much to work with. As a sidenote, this is the direct opposite of the Italian Western (which is one of my favorite genres) which is just the American Western filtered through a drunken nightmare which is exactly what seems to give it more room to fudge and play with the archetypes and distort the broad strokes. Rio Bravo is most definitely an archetypal American Western the parts of which are much better than the whole. It spins the yarn of Sherriff John T. Chance (John Wayne at his most John Wayne-iest), head lawman of the titular border town. In his employ is Walter Brennan as Walter Brennan… I mean, Stumpy, the crippled, toothless codger who nags everyone and speaks in adorable frontier witticisms. Also hanging around is Dean Martin as Dude, a man coming off what seems to be a years-long bender who was once Chance’s deputy before his life fell into a vat of alcohol. The setup: Oily, cold hearted Joe Burdette (Claude Akins) kills a man and is quickly taken to the hoosegow. As he is part of a family with pockets deep enough to hire every gunslinger in the territory, Chance and Company have their work cut out for them ensuring that Nathan Burdette (John Russell) doesn’t pull out all the stops to spring his brother Joe from jail before the Feds come and extradite him. Assisting Chance in his endeavor will be young gunslinger Colorado (Ricky Nelson) and Feathers (Angie Dickinson), the saloon harlot and card sharp who, not surprisingly, has a heart of gold. What works best about Rio Bravo is its setting. The film never leaves the confines of the main street of Rio Bravo and deals in minimal interiors (the jail, the saloon, the other saloon and the hotel). Like a space station, the town of Rio Bravo seems to exist in the middle of a vast nothingness and to travel one step outside of it means gambling with your life. Unlike the implausible settlement in the middle of nowhere at the beginning of John Ford’s the Searchers, Rio Bravo is a believable collection of Hollywood Western buildings and homes which also seems to occupy a real sense of place and time. The film’s classic Hollywood look helps keep things in check as the vibrant colors and impeccable framing reflect just what a visual filmmaker Howard Hawks was. On an actual critical level, there were a few things about Rio Bravo that nagged at me. Despite his run on Ozzie and Harriet, Ricky Nelson seems little more than stunt casting. His performance is most definitely the weak link here. And regardless as to why he was inserted into the production, it seems too calculated by half and is mostly a distraction. He’s not terrible. In fact, he pulls off a couple of moments quite well. But he sticks out like a sore thumb and seems to exist only to have an inexplicable musical duet with Dean Martin during the latter part of the film’s saggy middle act (and that guitar he strums looks so ridiculously anachronistic, he might as well have been wearing a Nudie suit while playing it). Also, despite looking great and turning in a fine performance, Angie Dickinson’s entire part is unnecessary. She adds nothing, does nothing (except throw a flower pot) and grinds the movie to a halt when performing the tender moments with John Wayne. Whoever acquiesced to the insistence that the movie needed to have a love story as one of its many subplots should have slept on it and done everything in their power to resist it the following morning. For me, the biggest revelation was Dean Martin. Relatively new to dramatic acting when the movie was made, Martin’s DT-plagued Dude is the most believable and has the most heartfelt character arc in the entire endeavor. In fact, I wish the movie would have been just about him. Dean displays some real acting lumber in all of his scenes and I bought every moment that was graced with his presence (except, of course, for the plot-stopping duet with Ricky Nelson which is probably the most tedious and dull musical number this side of “Beauty School Dropout”). By the end of Rio Bravo, I almost mourned the fact that, despite a couple of other well-received roles, Dean Martin didn’t go full speed ahead into dramatic acting and, instead, decided to hang back into the profitable, if limited, role of lovable drunk for the remainder of his career. The rest of my issues with Rio Bravo are mostly personal and lack any real critical weight. First and foremost, I mostly dislike John Wayne. For a long time, I couldn’t be certain if I disliked him because of the way his image has been appropriated, his debatable skill as an actor or his steadfast adherence to backwards politics. In the end, it’s probably a combination of all three. I simply cannot separate the man from what I see on the screen because there’s not enough raw talent to differentiate the two. I feel like I’m constantly watching John Wayne, the man, stumble through set pieces tailor-made for him and his certain brand of machismo (and, in my defense, Wayne would take or turn down projects based on his politics… the Green Berets, anyone?). And, Rio Bravo, itself, was something of a political response to what Wayne felt was anti-American values in High Noon. Lest I be accused of being no better than those who stay away from Sean Penn or George Clooney due to their politics, I don’t feel the same way towards Jon Voight who has political views, like John Wayne, diametrically opposed to my own (and has espoused some truly loony things) but still manages to win me over with his performances because of his immense gifts as an actor. And this is also in contrast to someone like Vin Diesel who, while no great thespian, cuts a Wayne-esque presence in his movies that I enjoy and buy a lot quicker than those offered up by the Duke whose presence seemed more of a case of a reputation preceding it and less physically deserved. And whatever I can say for John Wayne, I can doubly say for Walter Brennan who I’ve seen in many a movie and can attest that he does not deserve to be on the same shortlist of actors who have won three competitive Oscars (the other two on the list are Daniel Day-Lewis and Jack Nicholson). The only thing I can say that’s amazing about Walter Brennan is that he always seemed to look ancient, no matter what age he actually was when filming whatever project. Secondly, again, is my dislike for the American Western. So steeped in broad “good and evil” tales and corny macho sentiments like they were Silver Age comic books, the American Western has so few elements to mix and match to create something compelling. How many cowhands, young guns, weary sheriffs, misunderstood floozies, drunks, stereotypical minorities and dusty townscapes can you disassemble and reassemble into something that’s fresh? And there was my major issue with Rio Bravo; there was absolutely nothing surprising in it for me. I watched it lazily unfurl its unjustifiable 140 minute running time, dealing with one overdone trope after the other, knowing full well there were fistfuls of movie that could have just been cut or rewritten and tightened up (John Carpenter, a massive fan of Rio Bravo, could arguably have done Hawks one better by boiling the major points of the plot down to exploitation film levels for his incredible and enormously entertaining Assault on Precinct 13). Sure, Leigh Brackett’s script is very Hawksian and the characters definitely have both Brackett and Hawks’s stamp all over them but I sometimes felt many of them would have worked better in another movie altogether. As good as the (mostly) wordless opening sequence is, the final eight minutes of the movie, occurring after the climactic showdown, simply drag while tidying up the myriad subplots that, as stated, would have been better suited somewhere else. And, again, none of this should make it sound as if I disliked Rio Bravo. I liked it despite my misgivings about it. Howard Hawks was a master filmmaker and it’s easy to see why Rio Bravo is considered an example of his greatness. Despite its length, many subplots and casting decisions, the movie was heavily enjoyable and I was never bored. Much of it made me smile and the chemistry between the males worked surprisingly well. 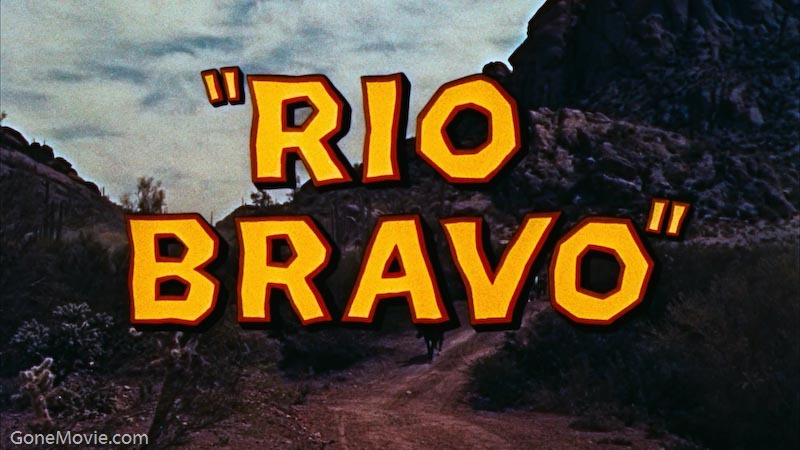 However, at its heart, Rio Bravo is a story of redemption; a story about a drunk who regains face at a time of crisis. Sadly, due to the powers that be that dictated such things, its strongest element is relegated to the backseat so John Wayne and Angie Dickinson can kiss and have an uninteresting cinematic romance. Get a room, you two. And an editor.